When Berkeley students derailed the imminent arrival of Panda Express on campus last year, their strongest argument against the fast-food chain was the vision of an alternative — a market that would provide local, sustainable, healthful foods. On Monday, their vision became a reality when the Berkeley Student Food Collective threw open its doors on Bancroft Way, directly across from Eshleman Hall and steps from Sproul Plaza. By afternoon, it was buzzing with customers. Fresh fruits and vegetables, most grown within 150 miles, filled shelves and a refrigerator case, alongside coolers stocked with Straus milk, Glaum eggs and Columbia Gorge juices, all organic. Bulk bins offered dozens of staples, from flour to rice to chocolate chips, that students — not to mention faculty and staff — can take home for a meal or a batch of cookies. Wraps, sandwiches, coffee and tea also will be sold, offering a “real food” lunch option close to campus. By operating as a nonprofit collective, with members donating two hours of free labor a week, the store hopes to keep prices low. Since August, when they signed a lease on a former nail salon, members have been hard at work converting the 600-square-foot space to a food market. Giant vegetables in the mural along one wall loom over last-minute planning by collective members Alex Stone, Shaun Mullen, and Christina Oatfield. The collective came together around the Panda Express protest, which also spawned CoFed, a Brower Center-based nonprofit that is supporting students running nascent food coops on several campuses in California, Oregon, Washington and British Columbia. Yonatan Landau, an ’08 grad who helped lead the protest and the founding of the collective, is co-founder of CoFed, the Cooperative Food Empowerment Directive, and Stone has been a part of it as well. 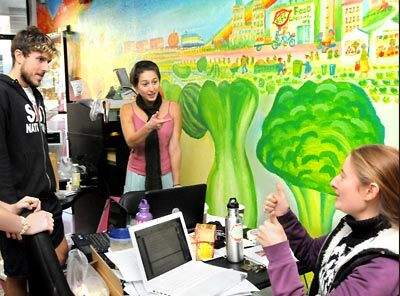 The Berkeley Student Food Collective now has some 50 active members gathered around a core group of 15, who make decisions democratically, according to Brighid O’Keane, a 2004 graduate of the University of Colorado who had experience working with international food issues and was hired to shepherd the store through its planning stages. More than 1,000 students and recent graduates are supporters, she says. Building a new small business turned out to be an education in itself, she says. Members had to learn to raise capital and to navigate not only campus officialdom but the city of Berkeley’s bureaucracy, O’Keane says. The students incorporated as a California nonprofit, and won a $91,000 grant from Berkeley’s The Green Initiative Fund (TGIF), which commits a small part of student fees to sustainability projects. It has also raised nearly $60,000 from other campus entities, foundations and private donations, the bulk of which came through the New Alumni Challenge. Initial hopes of landing a space in lower Sproul vaporized early on, and were replaced by plans for a food truck selling sustainable sandwiches, coffee and juices. When that idea became hopelessly snarled in red tape, O’Keane recounts, the campus’s Capital Projects office came up with a solution. A university-owned storefront across from campus was looking for a tenant. The lease was signed in August. In addition to readying the space, the group had to work out its food-buying policies. It developed a philosophy that adheres closely to the principles adopted by the Real Food Challenge, a national student organization devoted to bringing more local, sustainable food to college campuses around the country. “Their goal is 20 percent ‘real food’ by 2020, but we felt 20 percent wasn’t enough. We’ll be 100 percent,” says Stone. 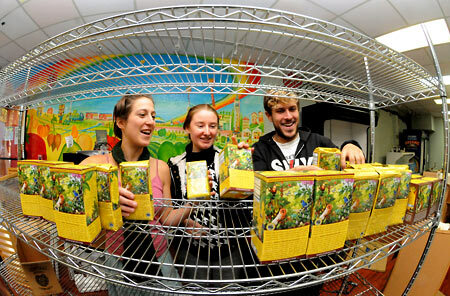 Students Stone, Oatfield, and Mullen arrange their first delivery — boxes of yerba mate — on newly assembled shelves. The Real Food Challenge criteria for judging the worthiness of a food ask if it is local and community- based, ecologically sound, humane and fair. For instance, produce and other unprocessed foods must be grown within 250 miles, and it’s even better if the store personnel know the farmer who grows it. Eggs must be cage-free and organic, and it’s even better if they’re certified humane. The Berkeley collective added its own requirements. Farms that produce eggs and milk will have to allow visits from members. And it plans to buy most of its produce from within 150 miles when possible. The market won’t carry meat to start with, because it hasn’t located a producer that meets the group’s standards. The collective’s principles call for buying from independently owned companies, but that proved tough, too, O’Keane says, because a lot of organic companies have been bought by large corporations, but product labels don’t reflect that. Coffee, spices and chocolate all get an exemption from the 250-mile rule, but the collective took pains to select fair-trade products. Getting the space ready proved labor-intensive too. By last Wednesday, the plumbing was in, but the shelves still needed hanging. Bulk bins, acquired cheaply from an Emeryville coop that went out of business, had to be washed. Three refrigerators had to be shouldered into place. The first food arrived in the store last Wednesday, more than a year and a half after the Panda Express protests and almost three months after the collective took over the storefront. Stone, along with fellow members Christina Oatfield and Shaun Mullen, looked jubilant when they took delivery of a case of Guayaki yerba mate, then 15 cases of organic eggs and boxes of bottled juices. By Monday morning, one refrigerator was still being worked on and a heap of cardboard boxes needed to be moved out as the market opened for business. The Berkeley Student Food Collective is planning its second annual Harvest Gala fundraiser at the David Brower Center, 2150 Allston Way, on Nov. 20. Down the line, the collective hopes to move its store to Lower Sproul, after the plaza is renovated.